Pollen that is collected by honey bees is referred to as bee pollen. The grains of pollen that make up bee pollen are the tiny, male reproductive units (gametophytes) that form in the anthers of flowering plants. The majority of plants on the planet today require that their pollen be transferred onto the receptive stigma of flowers (pollination) by wind, water, birds, bats, butterflies, beetles or bees, the most important species. The characteristics of bee pollen will depend upon the plants from which it is gathered. Some honey bee foragers collect only nectar, some both nectar and pollen, and some only pollen. But flower fidelity, visiting only a single species of flower in one trip means the pollen pellets (one on each leg) will tend to be all from the same type of plant and uniform in color and can range from white to black. While pollen provides almost all the bees proteins and nutrients, there is no single type of plant that produces bee pollen that will have all the vitamins, minerals, fats and proteins in exactly the right ratios for optimum honey bee health. (Di Pasquale, 2013) Bee pollen is also the nutritional and mineral source for the production of royal jelly by worker bees. As a result, a bee colony will tend to forage on a variety of pollen sources and bee pollen will tend to be a mixture of pollen from all the different species of plants that the colony’s foragers are able to visit. collected by foragers into cells where it undergoes fermentation in the process of becoming bee bread. These cells are filled with pollen but have not been given a final capping of honey and wax needed for long-term Winter storage. As bees fly through the air, they build up a positive static-electric charge on their body. This helps them to collect the pollen dust from the flowers they visit since the negatively charged pollen will be attracted to, and stick to, the bee’s body in much the same way that a balloon rubbed against a wool sweater will stick to the wall. Once the bee’s body is covered with fine pollen grains, the bees will use stiff hair-like structures on her legs to groom themselves and “comb” all the pollen off their body. Some honey or nectar is regurgitated from the honey stomach and mixed with the pollen grains in order to help them stick together. Special hair-like structures which are situated on the tibia on the bee’s hind legs and nicknamed the pollen baskets (corbicula) are used to pack the pollen into small pellets to be transported back to the hive where it is used primarily for feeding and raising the young. This is why most pollen in a hive is typically found stored in and around the brood nest. 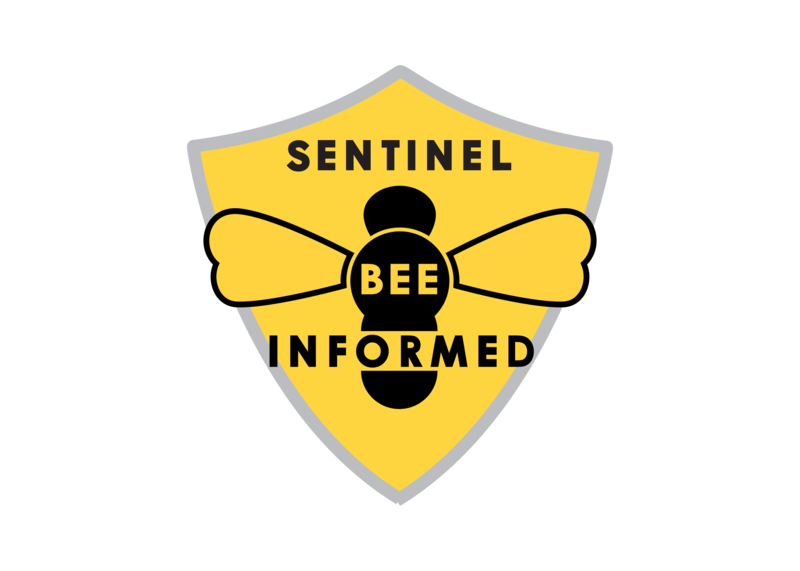 Fresh pollen is high in moisture and protein and, especially when brought into the hive – which stays around an internal temperature of 95˚F (35˚C) – it enters an ideal environment for mold growth. When the pollen is not consumed fresh, honey bees ferment the pollen through the process of making bee bread. 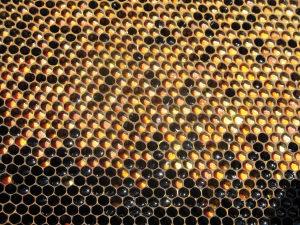 To make bee bread, worker bees fill approximately three-quarters of a honey comb cell with pollen and then fill the remaining quarter of the cell with honey. 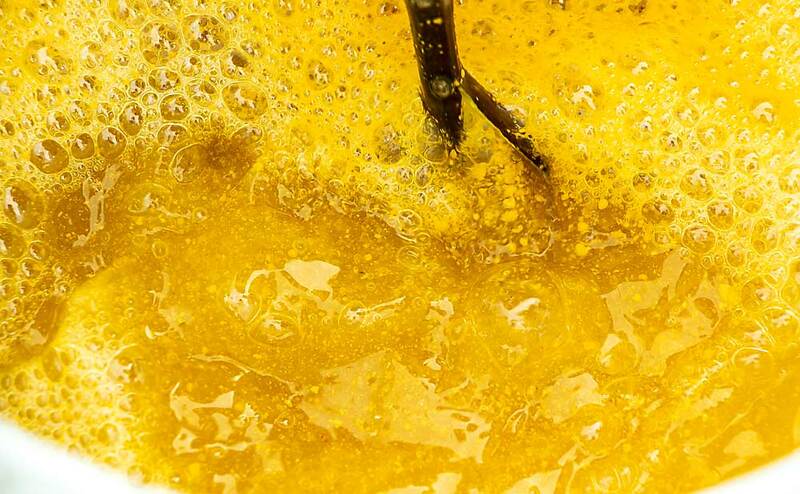 The cell is then capped with wax. This helps preserve the pollen for future use (Anderson 2014) and it is theorized that it has the potential to make some nutrients more accessible for honey bee nutrition, although the science establishing this is weak. While the carbohydrates (sugars) in honey provide bees with energy, honey bees get all their vitamins, minerals, fats and protein from bee pollen. Bee pollen is collected by beekeepers with the use of pollen traps, devices that fit over the entrance to a hive and contain openings just big enough for a returning forager to squeeze through. In the process of squeezing through the opening in the trap, the pollen carried on the hind legs of the bee are knocked off and falls through a screen into a drawer where it is collected by the beekeeper. There are many pollen trap designs available and in use. No matter what type of trap is used, it is important that all other entrances to the hive be closed off or returning foragers will quickly learn to enter from them in order to retain their pollen loads. I have also observed colonies that modify their foraging behavior and return with smaller pollen loads that are able to fit through the narrow opening of the pollen trap without being knocked off the hind legs of the returning bee. Due to the highly perishable nature of fresh bee pollen, the pollen collected in a trap needs to be collected daily and immediately preserved in some way to retard mold growth and maintain the pollen’s nutritional and medicinal properties. This makes pollen production very labor intensive, and as a result the majority of pollen available tends to come from other countries that have lower labor costs. 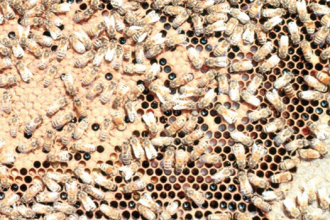 Trapping pollen has the potential to inflict significant nutritional stress on the colony. Some traps are best only applied to a hive for a short period of time, providing a small amount of pollen for the beekeeper. Such traps may also be applied for a few days and then removed for a period of time, before being reapplied so that the colony is able to obtain a reasonable inventory of pollen for its dietary needs. Some pollen trap designs even advertise that they only trap a certain percentage of pollen from a hive, therefore allowing the trap to be left on the hive continuously, hopefully without causing undue stress and a reduction in the colony’s population growth too severely. 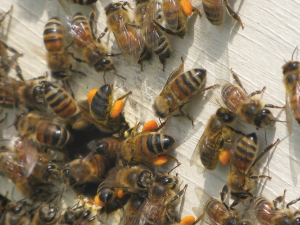 Colonies with traps usually quickly change the atio of pollen:nectar collectors to compensate for reduced pollen collection. Depending ont he efficiency of the trap, many nectar collectors may be recruited, reducing a potential honey crop. Fresh pollen typically contains 10% to 12% water, while the moisture content of dried pollen is around four percent. It is estimated that drying in the sun may decrease the potency of pollen by as much as 50% due to oxidation of antioxidants. As a result, the best way to preserve pollen once it is collected is to freeze it immediately after harvest. The next best approach would be to refrigerate. When preserving pollen through drying, it is preferable to dry the pollen at a temperature of around 86°F (30°C) and dry it in the dark. While pollen is a common ingredient in many products, pure bee pollen for human consumption comes as granules, just as they appeared on the hind legs of the foraging bees. 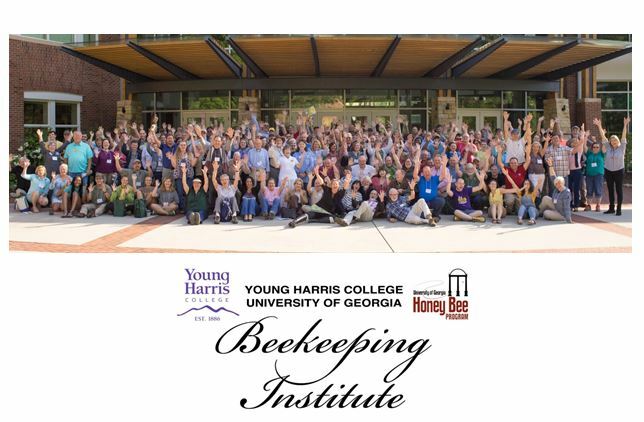 Next month we will explore the human health implication of bee pollen. 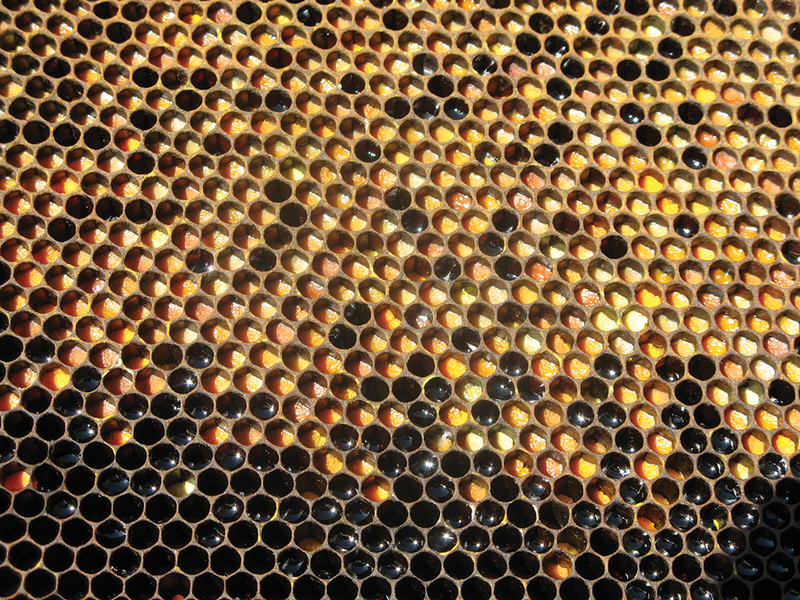 Anderson, Kirk E, Mark J Carroll, Timothy H. Sheehan, and Brendon M. Mott, Patrick Maes, and Vanessa Corby-Harris, (2014) Hive-Stored Pollen of Honey Bees: Many Lines of Evidence Are Consistent with Pollen Preservation, Not Nutrient Conversion, Molecular Ecology, 23: 5904–17. doi:10.1111/mec.12966. 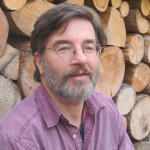 Di Pasquale, G., Salignon, M., Le Conte, Y., Belzunces, L.P., Decourtye, A., Kretzschmar, A., Suchail, S., Brunet, J., Alaux, C., (2013) Influence of pollen nutrition on Honey Bee health: Do pollen quality and diversity matter? PLoS ONE http://dx.doi.org/10.1371/journal.pone.0072016. Fernandes-Da-Silva, P.G., and Serrão, J.E., (2000) Nutritive value and apparent digestibility of bee-collected and bee-stored pollen in the stingless bee, Scaptotrigona postica Latr. (Hymenoptera, Apidae, Meliponini) Apidologie 31: 39–45. Gilliam, Martha, (1979a) Microbiology of Pollen and Bee Bread: The Genus Bacillus, Apidologie 10 (3): 269–74. Gilliam, Martha, (1979b) Microbiology of Pollen and Bee Bread: The Yeasts, Apidologie 10 (1): 43–53. doi:10.1051/apido:19790304. Gilliam, Martha, Prest, D. B., Lorenz, B. J., (1989) Microbiology of Pollen and Bee Bread: Taxonomy and Enzymology of Molds, Apidology 20: 53–68. doi:10.1051/apido:19890106. Herbert, EW & Shimanuki, H., (1978) Chemical composition and nutritive value of bee-collected and bee-stored pollen. Apidologie 9: 33–40. Mattila, Heather R., Daniela Rios, Victoria E. Walker-Sperling, Guus Roeselers, and Irene L G Newton, (2012) Characterization of the Active Microbiotas Associated with Honey Bees Reveals Healthier and Broader Communities When Colonies Are Genetically Diverse, PLoS ONE 7 (3), doi:10.1371/journal.pone.0032962. Vásquez, Alejandra, and Tobias C. Olofsson, (2009) The Lactic Acid Bacteria Involved in the Production of Bee Pollen and Bee Bread, Journal of Apicultural Research 48 (3): 189–95. doi:10.3896/IBRA.1.48.3.07.